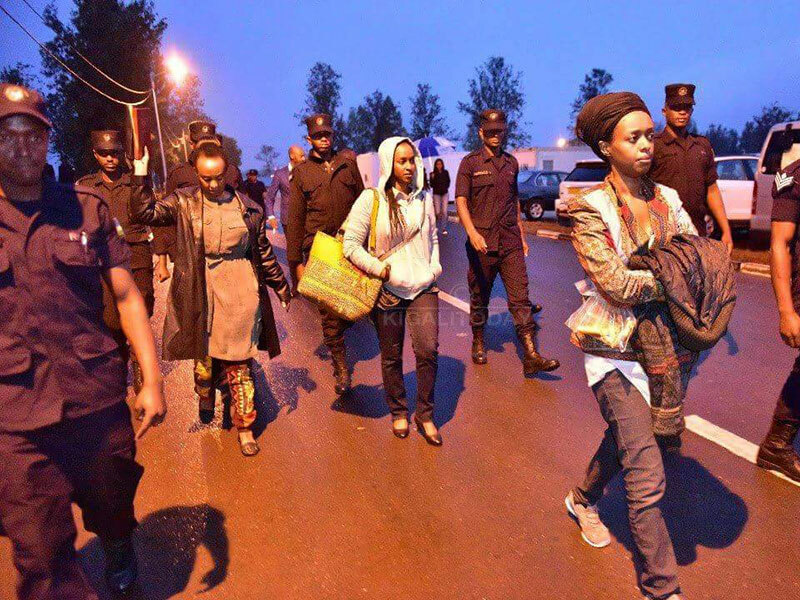 RWANDA–Pita pata of the rain brings forth cold and the significance of Monday’s daylong rain in Kigali struck home for the Rwigara family when police raided their home in the upscale Kiyovu environs of Kigali in the afternoon. Diane Rwigara Anne Rwigara and their mother Adeline Rwigara were led from the gated expansive compound to a waiting police van and whisked away to the criminal investigations department. They carried extra warm clothing in anticipation of sleepovers in the cold cells on Monday night. The arrest of the Rwigara women ended days of speculation about their ‘disappearance’, with a section of media reports indicating that they were in custody. But Rwanda police said yesterday that the Rwigara’s had locked themselves in the family home and cut off communication with the outside world for reasons best known to themselves. Police also denied that the three Rwigara’s had been arrested, insisting they were only being taken in for questioning in ongoing investigations into forgery and tax evasion. But the high perimeter wall and towering gate was what awaited police at 16:30 CAT. After more than half-an-hour of wainting, police sought a warrant for forced entry into the family home. A ladder was soon placed against the gate and the raid mounted. The three Rwigara women and two boys were found huddled in the kitchen, police said, but insisted that the warrant only allowed for the suspects to be taken in for the questioning and that they were not under arrest. “They have been brought to CID for questioning, after refusing to respond to three summons as stated by the law,” said Theos Badege, the police spokesman, who added that that three initial summonses were for the trio to appear before CID were not respected. Diane Rwigara started drifting away from President Paul Kagame’s government around the time she made a shock decision to challenge Kagame’s continued stay in power. The Rwigara family have had long running close ties with the Kagame government and ruling Rwanda Patriotic Front leadership, with the father said to have been one of the top financiers of the party. But Assinapol Rwigara was killed in a car accident in Kigali two years ago and now his daughter has emerged as a strong critic of the regime who demands that the Kigali government opens up all avenues for citizens who are dissatisfied with certain affairs of the state to criticise openly. 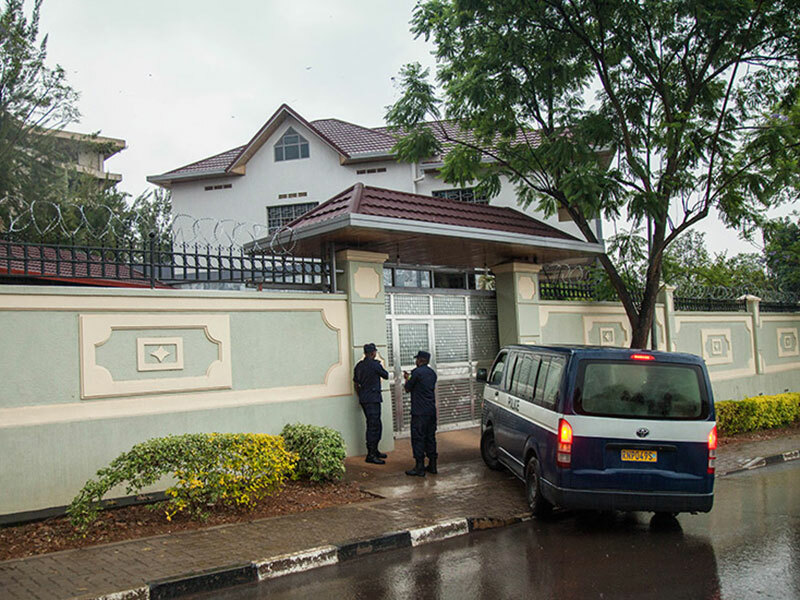 Police at the Rwigara family home in Kigali. Net. Diane Rwigara’s attempt to run against Kagame at the recent elections was, however, swatted by the electoral commission for failure to fulfill all the requirements for nomination. It is one of these issues that threw the 35-year-old into a trouble with the law after she was accused by one of the political parties that chose to back Kagame’s re-election in August of illegally using signatures of its registered party members on her nomination forms. Kagame won the August 4 presidential election with close to 99 percent of the total votes cast. He was also challenged by Green Party’s Frank Habineza and Philippe Mpayimana, an independent. Rwigara was also accused of forging signatures of at least three long deceased voters. She denies the accusations and maintains that she had furnished the electoral commission with all the necessary requirements and that she was being framed for forgery. At the height of the controversy, police also picked interest in allegations that the family had evaded taxes. It is this latter issue for which Diane’s mother and sister have been taken in for questioning as well.